Here is our lovely filigree Sacandaga brooch - a delicate 2-7/8" wide, 2-1/4" to the tip of its' 'enchanted forest' gemstone dangles. 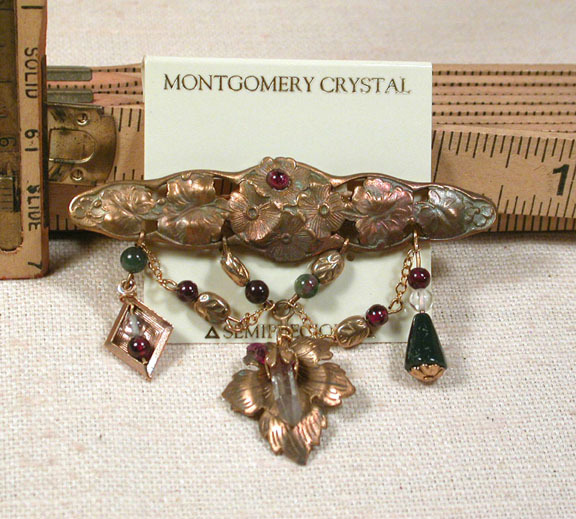 Brass leaf-patterned beads with fine cable chains connect red wine garnet beads, bicolored green and rose fancy jasper beads, rock crystal beads, and a moss agate cone shaped bead to a sweetly shaped brass leaf carrying a petite capped rock crystal. 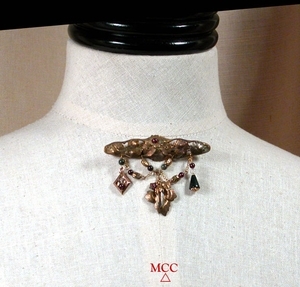 More garnets accent the leaf and the top flower of the Victorian style pin - a great look for your dresses, turtleneck sweaters or coat!